We can’t stress this enough. 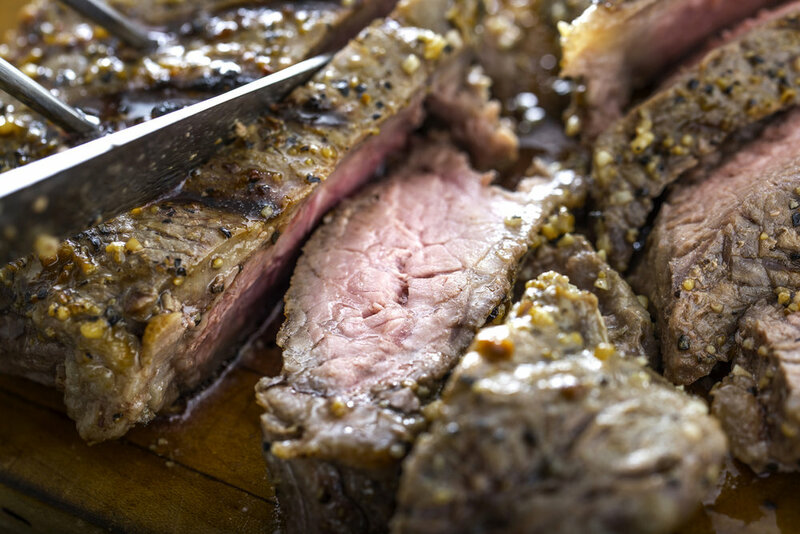 When you slice a steak too early, you’re letting the juices inside escape, leading to a dry, flavorless cut. Once your meat has cooked to your liking on the grates of your Argentine Grill, place it to the side and let it rest for three to five minutes. This lets the juices relax the meat. Resting times depend on the size of what you’ve just cooked. Larger pieces of meat – roasts for example – will need longer resting times. When talking about meat, “the grain” refers to the alignment of muscle fibers. It’s easier to identify in tougher cuts like flank steak than in leaner varieties of steak, such as tenderloin. By slicing the meat against the grain, we cut through those fibers, increasing the tenderness of the cut and making it easier to chew. When we slice with the grain – in the direction as the fibers – we’re left with a chewier piece of meat. Using a cutting board makes slicing meat easier and safer. There’s less chance of the meat – or your knife – slipping, and you’re less likely to damage your countertop. Feel free to trim off fat and surface muscle to enhance flavor, but don’t away so much that you’re giving yourself less meat. 4. What if we’re serving chicken? To slice a chicken breast, place it on a cutting board, skin side up. Start at one end, and pull the skin away from the meat. Use a boning knife to cut meat away from one side of the breastbone, cutting as close to the bone as you can. Cut the meat away from the rib bones using a sawing motion, pressing the flat side of the knife against the bones. Gently pull the meat from the bones as you cut. Chicken sounds pretty good right now, so we’ll end – as we often do – with a recipe, for Argentine Grilled Chicken. Use a blender to pulse marinade ingredients until they’ve been pureed. Marinate the chicken in a plastic bag for at least four hours. Pre-heat the grill over medium-high heat. Remove chicken from bag. Grill until the chicken reaches your desired doneness, for about 5 to 7 minutes on each side. If you don’t have a grill – or are unhappy with the one you have – Gaucho Grills can help. Visit our website to find the right Argentine grills for your next cookout. Our grills will do their job. It’s up to you to find the right way to cut what you’ve cooked.